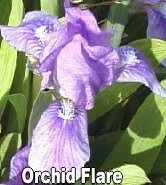 'Orchid Flare' (Leona Mahood, R. 1960). Seedling #A-9-17. MDB, height 8" (20 cm). Early bloom. Color Class-V5. Rosy orchid self; white beard. 'Green Halo' X 'Cretica'. Leona's Gardens 1961. Honorable Mention 1973; Caparne Award 1978. JPG orchidflair.JPG manage 130 K 17 Jul 2018 - 19:52 Main.TLaurin Photo by Nancy McDonald-The Pickle Barrel Collection. JPG orchidflair01.JPG manage 529 K 17 Jul 2018 - 19:54 Main.TLaurin Photo by Nancy McDonald-The Pickle Barrel Collection. JPG orchidflair02.JPG manage 609 K 17 Jul 2018 - 19:56 Main.TLaurin Photo by Nancy McDonald-The Pickle Barrel Collection. JPG orchidflair03.JPG manage 527 K 17 Jul 2018 - 19:59 Main.TLaurin Photo by Nancy McDonald-The Pickle Barrel Collection. JPG orchidflair04.JPG manage 487 K 17 Jul 2018 - 20:01 Main.TLaurin Photo by Nancy McDonald-The Pickle Barrel Collection. JPG orchidflair05.JPG manage 479 K 17 Jul 2018 - 20:02 Main.TLaurin Photo by Nancy McDonald-The Pickle Barrel Collection.